What’s that? You don’t like 4-H? Are you crazy or something? This month your usual reporter, Laura, is getting a break. Instead you get to read about the exciting world of the University Archives from me, Brad Kuennen, Library Assistant. Please note: Laura had nothing to do with this blog post other than asking me to do it. She may yet regret that decision. This week Iowa State welcomes over 1000 teenagers to our campus for the 2012 Iowa 4-H Youth Conference. In honor of their visit I will be sharing my 4-H story, though it is pretty much limited to working with the historic 4-H records that we have here in the archives. I’ll admit it, I was never in 4-H. I never wanted to be in 4-H. I never much cared for livestock or animals. When I was younger the barns were the one place I used to stay far away from when our family went to the county fair. Maybe it was just the smell, but I always preferred the tractor sheds to the animal barns. So you can imagine my less than enthusiastic response when I learned that I was being assigned to organize our Iowa 4-H records. That was over two years ago and now that the work is finished I have to admit that I have gained newfound respect for 4-H.
Jessie Field Shambaugh. 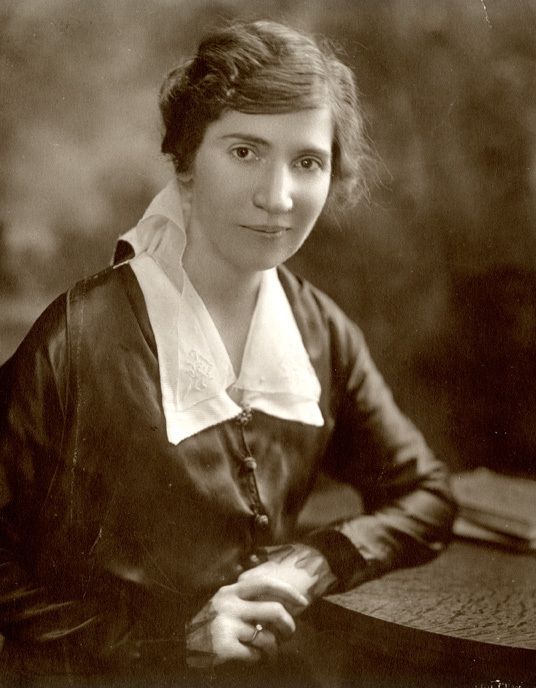 In 1904 she brought the idea of boys and girls clubs to her school in Page County, Iowa. As every good 4-Her knows, 4-H was started in Iowa. Well, not really. Apparently someone in Ohio beat us to the punch, but Iowans played a crucial role in the development of the 4-H movement. Iowans like Cap E. Miller, Jessie Field Shambaugh, and O. H. Benson helped guide the movement of “club work” for rural youth from a local level to one of statewide and national recognition. Even today, Iowa maintains one of the strongest 4-H programs in the country which is definitely something we can be proud of. In the early years of 4-H in Iowa, the clubs were strictly separated between boys and girls. Boys studied agriculture and girls studied home economics. Boys competed in livestock shows and corn growing while girls competed in baking contests and dressmaking. There may have been some girls who showed livestock, but that was very unusual at that time. One of the best parts about going through our earliest records is looking at all of the photographs. Each annual report, and there was one report made for boys clubs and one for girls clubs every year, is full of photographs, reports, and programs. Our collection of Iowa 4-H records also includes scrapbooks created by the State 4-H Club Historians. Sorry guys, but the girls tended to do a much better job of scrapbooking than you did. One notable exception is a photo scrapbook created by Paul Sauerbry which provides a wonderful account of 4-H in the 1920s. Sauerbry was a member of the 1928 Iowa delegation to the National 4-H Camp and must have created this scrapbook several years later. 1929 Iowa Delegation to the National 4-H Camp. Paul Sauerbry, who makes a mean scrapbook, stands second from the right. As I was working with these materials I caught myself thinking about what life must have been like on a farm in rural Iowa. For most kids life was the farm. Sure, there was school to go to, but after school was finished there were a lot of chores to finish on the farm. Socializing with the kids down the road was probably not an option most afternoons. When boys and girls clubs were introduced, it had to be very exciting for the kids. Yes, they were going to learn some useful skills, but the club meetings also provided an opportunity to socialize. At a time when many farms were still without telephones and electricity, the chance to talk with other kids must have been quite a treat! And the trips some kids got to take! A lot of kids at that time hardly ever left their own county, but during the summertime hundreds of kids would gather at Iowa State for the annual convention. And each year several lucky kids would get a chance to attend the National 4-H Congress in Chicago or attend the National 4-H Camp in Washington D.C. In the 1920s and 1930s, that had to be an amazing experience! 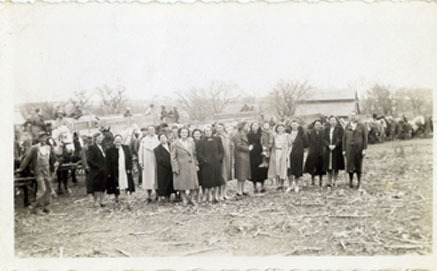 Photograph of Iowa girls 4-H members who attended the 1929 annual convention. 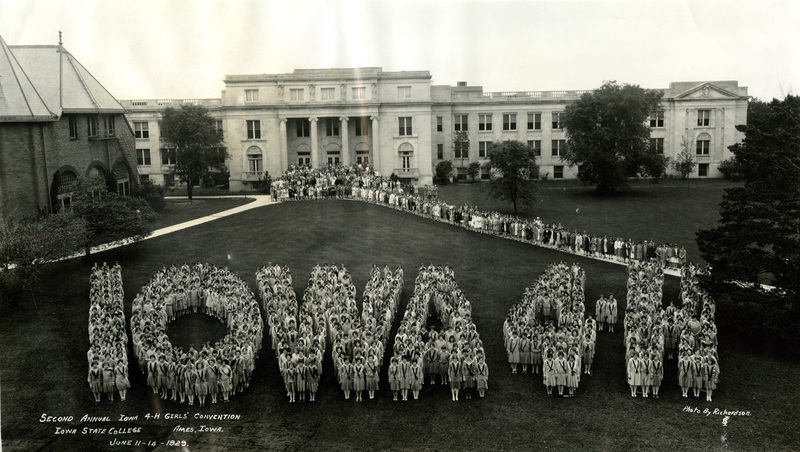 This formation was created on the lawn in front of the home economics building at Iowa State. Going through the boxes I came across some other books. These had me a little confused. They looked like scrapbooks, but they were full of project records and some had photos and writings. I was told by our resident 4-H expert (so titled because she was in 4-H as a youngster) that these were record books. As it turns out we have record books of several former members. The James Kearns Papers contain his 1934 award-winning record book along with many of his medals and ribbons. A page from the 4-H record book of James Kearns along with his beanie hat from the 1934 National 4-H Congress and other medals and ribbons. Speaking of medals and ribbons and stuff, the University Artifact Collection also contains dozens of other 4-H items. For example, we have samples of each of the incarnations of the girls’ 4-H uniform through the years. The early dresses were all homemade. Other artifacts in our collections include pins, buttons, belt buckles, mugs… the list goes on and on. 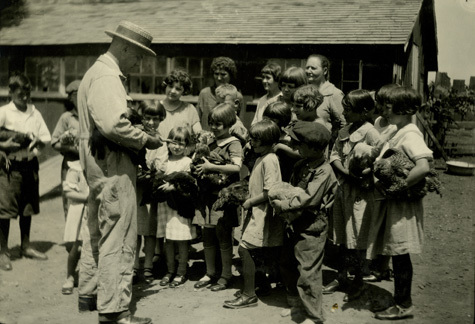 4-H Poultry Club, circa 1920s. This image is from the Paul Sauerbry 4-H Scrapbook. If I have learned one thing about 4-H after spending many hours waist-deep in these records it’s that my perception of 4-H was completely wrong. I always assumed it was just for people who liked to take a nap with farm animals at the county fair. Don’t get me wrong, it is for those people, but for so many others as well. What struck me most was that aspect that has been a part of 4-H since the earliest days–teaching children and young adults about leadership, responsibility, and taking pride in one’s work. That pride is evident on the faces of kids from the 1920s and, I can only imagine, will be displayed just as cheerfully on the faces of kids in the 2020s. If you have Iowa 4-H records or artifacts you would like to donate to the University Archives, please contact us. We would love to give those materials a permanent home here so that future researchers can look back in time and see what role 4-H played in the lives of Iowa’s youth. We are excited to announce that we now have a new exhibit in our Reading Room: “Head, Heart, Hands, and Health: The Iowa 4-H Experience”. 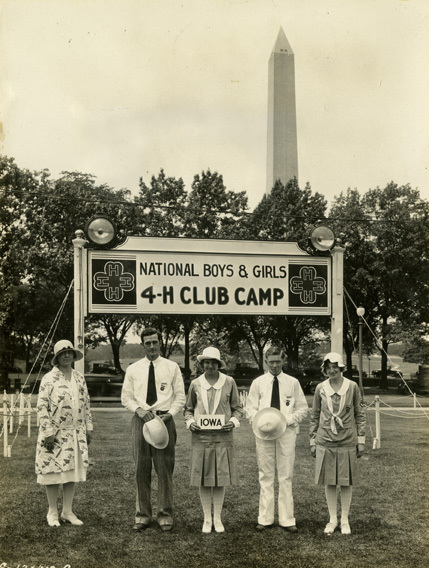 Read about and see some fun artifacts related to the history of 4-H: 4-H camp, the 4-H emblem, state conferences, early 4-H pioneers who were influential in its formation, and 4-H uniforms. Although there is no longer really an official 4-H uniform for 4-H, in years gone by 4-Hers were required to wear uniforms – we even have an example of a 4-H uniform for you to see in the exhibit! 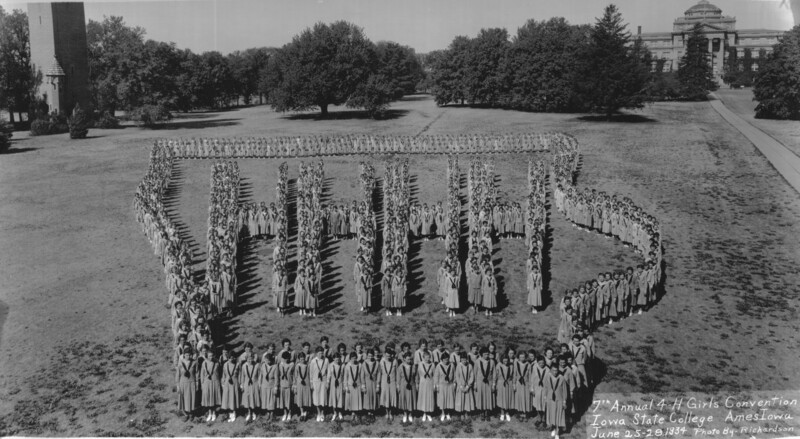 During the early state 4-H conferences, the attendees would have a group photograph in a different formation every year. In 1934, it was the state of Iowa enclosing 4 H’s. The photograph was taken on central campus. Beardshear and the Campanile can be seen in the background. The exhibit contains examples of more formations. Iowa was extremely influential in the formation and development of 4-H. The origins of 4-H clubs in Iowa can be traced back decades before the formation of the Extension Service and the formal organization of what we now know as 4-H Clubs. Interest in agricultural training for youth started as early as 1857 when the Iowa State Agricultural Society conducted a statewide corn growing contest for boys. This contest established some of the principles that were later used in the formation of 4-H: a contest was organized, a record of the project work was kept, the work was supervised, and a report was made. Subsequent contests were commonly held by institutes and fairs to provide educational and competitive opportunities for rural youth. Contests were also conducted by newspapers and agricultural magazines such as Wallace’s Farmer and Successful Farming. 1929 Annual Iowa 4-H Girls’ Convention formation. Margaret Hall (burned in 1938) can be seen on the left, and Mackay Hall in the background. For more information on the state 4-H conventions, see our earlier blog post. In 1902, A. B. Graham in Ohio began formalizing clubs for boys and girls to promote vocational agriculture as an extracurricular activity. His clubs, considered to be the founding clubs of 4-H, incorporated meetings, officers, and projects. In Iowa, Cap E. Miller, superintendent of schools in Keokuk County, was an early adopter of boys and girls club work. He began organizing Boys Agricultural Clubs and Girls Home Culture Clubs as early as 1903. O. H. Benson of Wright County and Jessie Field Shambaugh of Page County quickly adopted the club idea as well. Both would make major contributions to 4-H. Shambaugh wrote the “Country Girls Creed” and Benson is credited with creating the 3-H and later helping to create the 4-H clover emblem which became the official emblem of 4-H.
For more on the history of 4-H in Iowa, please take a look at the historical note in the Iowa State University 4-H Youth Development Records. And then come on up to see our exhibit in the Special Collections Department Reading Room, located on the 4th floor of Parks Library! August 26th of this year, when the 19th amendment became law, marks the 90th anniversary of women’s right to vote. What were Iowa women doing on August 26th, 1920? Some were attending the Iowa State Fair! August 26th was the second day of the 66th annual Iowa State Fair, which was held from August 25th through September 3rd in 1920. Did fair goers in Iowa know about the passage of the 19th amendment when attending the fair? I did not find any mention of women’s suffrage or the 19th amendment in the records I went through, but we can see a little bit of what young women were doing in 1920 at the State Fair, and in the years following the passage of the amendment, in the Iowa 4H Records (RS 16/3/4). This collection includes the Iowa 4-H Girls’ Clubs Annual Reports. (The finding aid/collection description for this collection is not yet online, but will be shortly.) Perhaps more out of coincidence than anything else, the first annual report for Iowa girls’ clubs was produced the same year as the passage of the 19th amendment (1920). 4H, then as now, provides hands-on experiences to help young people reach their full potential and includes opportunities for youth to develop their leadership skills. In the early part of the 20th century 4H was a great way for young women to advance their leadership skills, and learn what they were capable of, in order to more fully take advantage of their newly won right to vote. The 1920 Annual Report of 4-H Girls Club Work is also a wonderful window into the beginnings of 4H clubs. According to the writer of the report, very few if any girls’ clubs existed in Iowa on April 1st, 1920, and those which did existed only on a temporary basis, mostly in the spring and summer. The early 4H Girls’ Clubs in Iowa were divided into 5 different groups: canning, food study, meal preparation, garment making, and own your own room. In addition, the annual report states that “A Boys’ and Girls’ club Pageant was put on one day of the Fair. The girls’ club department had five floats. A float all in while labeled ‘The Queen of the Home’ headed the girls. One of the mothers all in white sat on her throne. The three girls all in white, the sunshine of the home, holding the reins.” Even though this first annual report of 1920 does not contain photographs, our university photograph collection does contain an image of the Queen of the Home float, pictured below. The Iowa 4H Records also contain the historian books for Iowa 4H Girls’ Clubs. The historians books begin in 1921 and contain more detailed information on 4H activities, including the Iowa State Fair. 1929 Annual 4-H Girls' Convention General Assembly held in the State Gym. This week, starting today, over 1,000 4-H members will be coming to the Iowa State University campus for the State 4-H Conference (June 29-July 1). 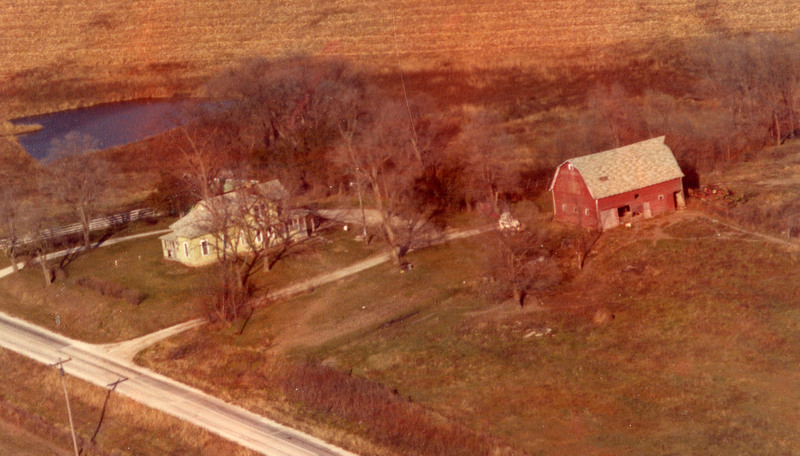 The history of the state 4-H conferences has been tied to the Iowa State campus since at least 1916, since the state conference (then called a short course) was held here at Iowa State in 1916. Then, as now, faculty and staff here at Iowa State actively took part in the state conference. In fact, on Wednesday and Thursday of this week, our collections archivist will be giving a workshop and tour of our department for State 4-H Conference attendees. The Special Collections Department here at Iowa State University holds records documenting the history of 4-H, especially here in Iowa. 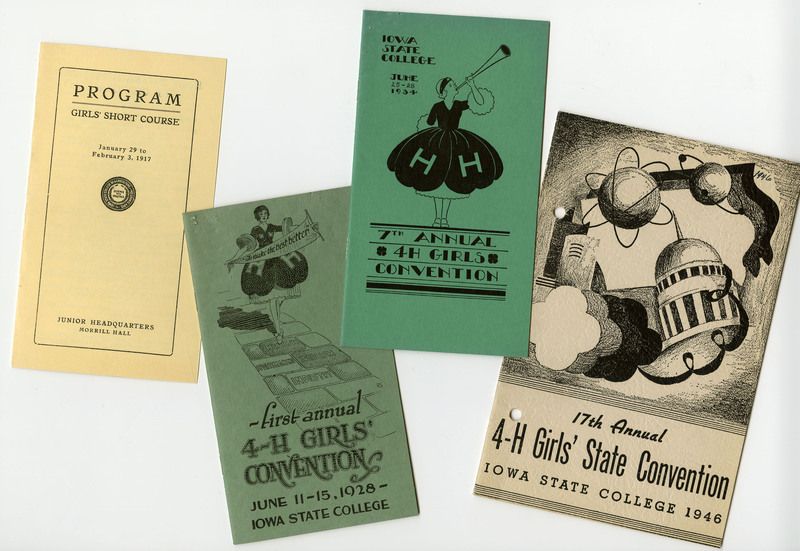 One can even find out a little about the history of Iowa’s state 4-H short courses, conventions, and conferences by just looking at the conference programs. The short courses (patterned after the Extension’s short courses for adults) began around 1916. 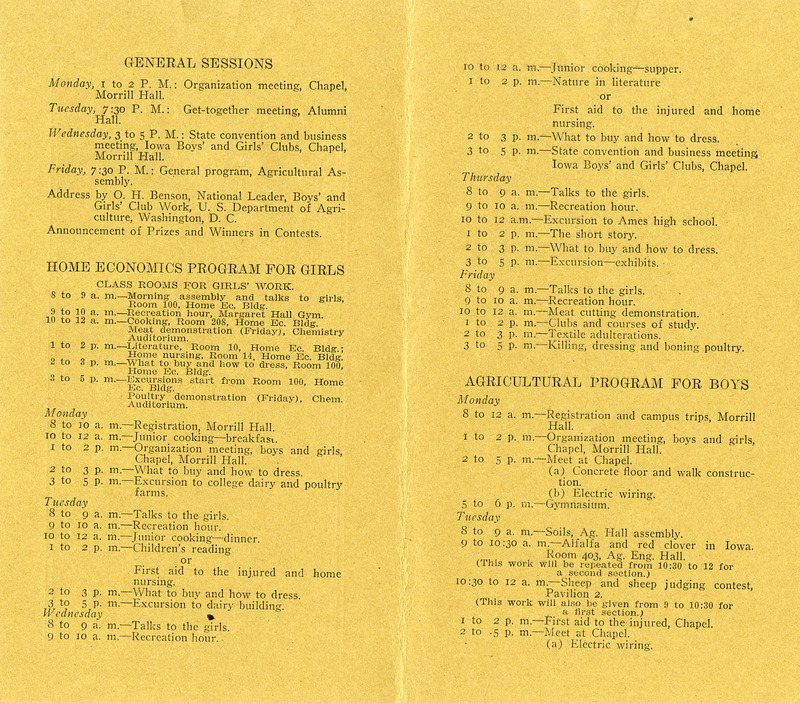 The year 1916 is used since this is the first short course program for 4-H members in our collection. More digging in the archives is necessary to find out if this is actually the first year an annual meeting was held! It is interesting to note that the 1916 Junior Short Course was for both boys and girls, although with separate programs for each. 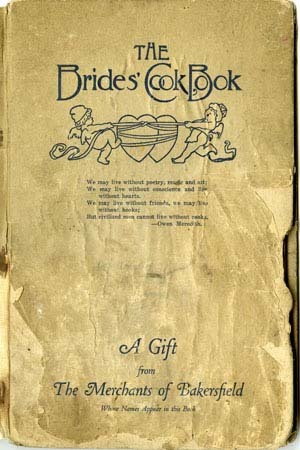 There was a home economics program for girls, which included cooking, literature, recreation, first aid and an excursion to the dairy building. The boys attended an agricultural program which included lessons on construction (concrete floor and electric wiring), soils, sheep and pigs, first aid, and the use and care of farm machinery. The 1916 Junior Short Course was held January 31 through February 5 in Morrill Hall. The next year, in 1917, separate short courses for boys and girls began. However, the boys’ and girls’ short courses were held at the same time and some of the activities were for both boys and girls. These early girls’ and boys’ short courses were not, however, held in the month of June. Instead, they gathered here at ISU in the winter, sometime in the cold months of December, January or February. The first conference (then called a convention) held in 1928. 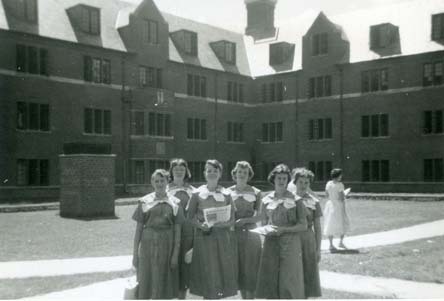 For many years, the group photo of the girls attending were in a formation. The caption reads "First Annual Iowa 4-H Girls Convention, June 11-15, 1928, Iowa State College, Ames, Iowa." The first actual convention for girls was held June 11-15, 1928, and it appears that this was the first time the state meeting was held in June. 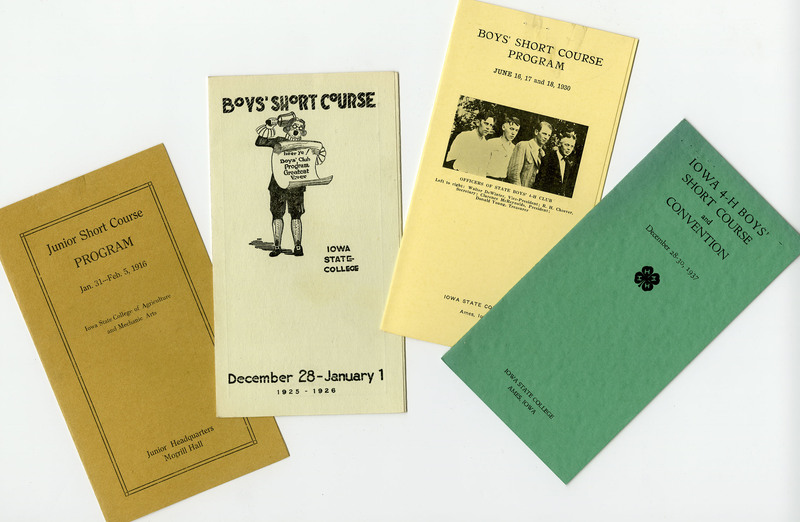 The boys continued to hold short courses (except for a brief period of time when they had short courses and a convention in the late 1930s and early 1940s). Another interesting aspect to note is that when the girls started having conventions instead of short courses, the annual meetings for boys and girls usually did not fall on the same days. Sometimes the boys had their meetings in June, and at other times in midwinter as before. Finally, the first State 4-H Conference, for both boys and girls, was held June 12-15, 1962. There’s a lot more that could be learned from looking at the state 4-H meeting programs, but I’ll stop here. Come and visit us if you would like to learn more. Please note, however, that for now, the collection where most of the programs reside (RS 16/3/4) is in the process of being put together for public use (what archivists call processing), but if you ask we can bring the boxes out for you to look at. 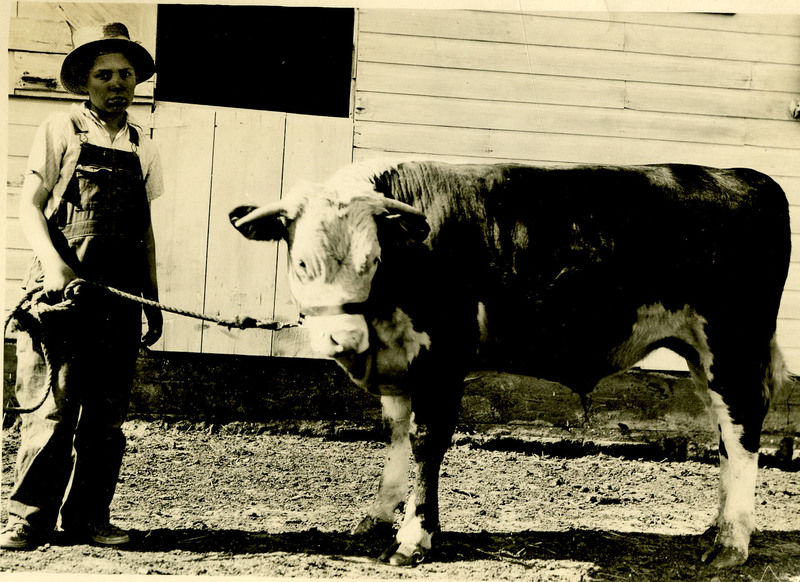 Most of the finding aids for processed 4-H collections can be found online: http://www.lib.iastate.edu/spcl/arch/inventories/16extension.html. Scroll down past the Extension collections for the 4-H records, which include historian books and other records for Story County 4-H, record books, photographs, and scrapbooks. 4-H records can also be found in the records of organizations and individuals involved in 4-H, such as the Burchett Papers which were described in earlier posts.